For collectors, tea towels embroidery patterns are a fascinating look at the domestic past. These beautiful towels added color and charm to the warm kitchens of the past. The oldest embroidered tea towels may well be the redwork, or turkeywork, designs that began to be popular in the late 1880s. Women instantly fell in love with the bright color as well as the fact that the dye would not run in this new thread. Huck weaving, also called huck embroidery, became popular in the United States in the early 1940s. It was known as huck weaving because it was most commonly worked on huck toweling, and even weave fabric used to make towels. This Art Deco medallion design was done in two different versions by the creator. This peach and the next slide, a dramatic maroon. Tea towels embroidery patterns were often used over and over again by the same craftswoman, as well as being passed from household to household. The companion towel to the previous one, this huck embroidered towel is done in maroon and green on a soft yellow. Black Americana designs, like this Aunt Jemima tea towel, were very popular motifs in the 1920s through the 1950s. These designs reached their peak in the 1930s, appearing on everything from towels to salt and pepper shakers. Cross stitch strawberry-designed tea towel is timeless. It could have been created anywhere from the 1940s through the 1970s. Red and white is a very popular color combination for a vintage kitchen. This days-of-the-week towel set portrays the chores that women commonly did on certain days. 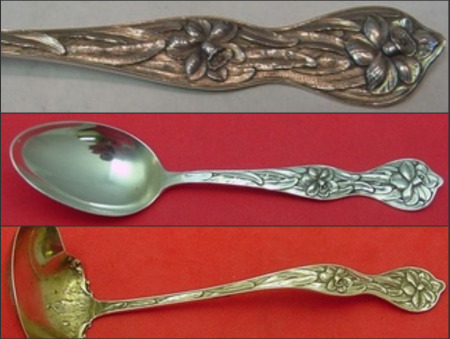 These designs have been popular since the very early 1900s and possibly before. The actual motifs have changed over the decades, illustrating what was popular in each era. Many early 1950s motifs, for example, depict Scotty dogs doing these chores. Vintage fabrics, like tea towels and other linens, can add a special touch to your kitchen. Even if they are damaged they can be recycled and used as valances, pillows, and other decor. When you see a tea towel you love, get it. They are fun and inexpensive pieces of the past. LoveToKnow wishes to thank Kathy of Grandma's House, who kindly supplied these images from her vast, online catalog of vintage kitchen (and other) collectibles.